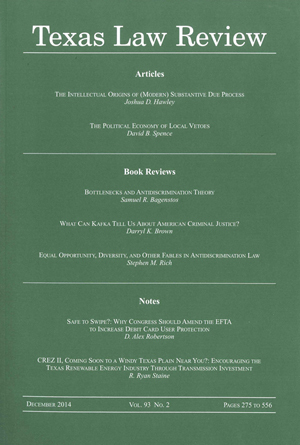 The Review publishes seven issues throughout the year beginning each November. Each issue contains contemporary and compelling articles, essays, commentaries, and book reviews from leading legal scholars. In addition, the Review includes student notes on current legal issues. The seventh issue, published every June, traditionally contains papers submitted during annual symposia featuring particular legal topics. This combination of analysis, review, exchange, and opinion makes theTexas Law Review a valuable and increasingly cited legal resource. TheTexas Law Review is established as a legal resource of particular importance to the national and international legal community. Nov. Dec. Feb. Mar. Apr. May. Jun.